This week the CTC Crew are choosing a project from the Sale-A-Bration (SAB) catalogue to CASE. There were some design features that I really liked with both bags, so I created a gusseted bag to adorn. You can easily hand fold one of these bags without any fancy tools at all. 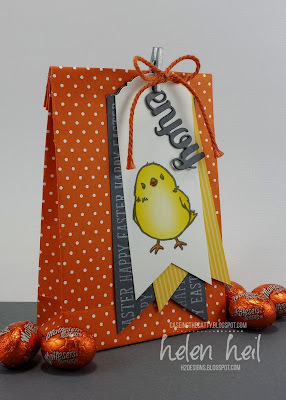 I have used a mix of current & retired products here but one of the things I was keen to utilise was the die-cut "enjoy" sentiment from the mini treat bag dies. There are so many extra options in the die sets that often get overlooked! I ended up folding the top of my bag over to the back, but I did use the tiny wave rotary cutting blade on the stampin' trimmer to get a sweet little fancy edge. 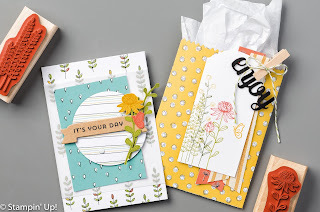 If you are feeling inspired, we would love you to CASE a project from the Sale-A-Bration catalogue & link it up in the gallery on the CTC post (click on the icon below). At the end of each month, the Crew will choose a Winner.